Cranker, K., & Servais, N. (2013). A move towards autonomy: Individualized education plans for effective materials use. Studies in Self-Access Learning Journal, 4(2), 96-124. Over the past twenty years, self-access learning centers have faced challenges related to accessibility of materials and the fostering of autonomy. There has also been progress towards meeting those challenges, such as Brigham Young University’s web-based database for searching SAC materials and linking curriculum to SAC materials (McMurry, Tanner, & Anderson, 2010). Following that example and developing it further, the University of Delaware developed a system called the Individualized Education Plan (IEP) that includes but goes beyond a Course Objectives Database (COD) similar to that of Brigham Young University. The COD alone was rather ineffective, but when the COD was combined with website resources and learner surveys modeled on Gardner and Miller (1999), the IEP emerged. A step-by-step guide to creating IEPs for use in other self-access environments is provided along with model forms. Finally, the results of informal surveys suggest that autonomous and goal-oriented learning might have been fostered by the use of IEPs. The first SAC was developed by Centre de Recherches et d’Applications Pédagogiques en Langues in France (Gremmo & Riley, 1995), and SACs have since gained popularity and stature especially since the 1990s. Recently, noteworthy descriptions of SACs and SAC research have appeared from diverse locations such as Japan (Cooker, 2010; Thompson & Atkinson, 2010), Mexico (Valdivia, McLoughlin, & Mynard, 2011; Westwood, 2012), Canada (Westwood, 2012), New Zealand (King, 2011), Hong Kong (Morrison, 2011), and the United States (McMurry, Tanner, & Anderson, 2010), to name a few. Cooker (2010) implies that the recent spread of SACs is due to the influence of Gardner and Miller’s (1999) guide to establishing and developing such centers. These centers have evolved and developed greatly over the past 15 years in terms of materials, integration into curricula, types of motivation, and effectiveness (Gardner & Miller, 2010). Goals of SACs include promoting autonomous learning, supporting classroom learning, and supplementing classroom learning by exposing learners to a wide variety and extensive amount of rich, authentic, interesting and enjoyable materials (Tomlinson, 2010). The first two goals can be contradictory to some degree, as it is entirely possible for students’ personal learning goals to differ greatly from what is taught in the classroom, and for class work to interrupt a student’s learning cycle in the SAC (Cotterall & Reinders, 2001). Thus, self-access is often a compromise ranging from teacher-directed homework to “projects” (Thompson & Atkinson, 2010) to fully autonomous learning (Jones, 1998). Despite this acknowledged compromise, SAC researchers are calling for integration into or linkage of SAC study with the classroom (Cotterall & Reinders, 2001; Gardner & Miller, 1999), and recent reports have described attempts to do so (McMurry, Tanner, & Anderson, 2010; Thompson & Atkinson, 2010). Thompson and Atkinson (2010) outlined attempts made to link their curriculum and the SALC at the Bunkyo English Communication Center (BECC). In this case, links were made through the implementation of extension activities and projects. The extension activities were meant to connect classroom studies to the SALC, whereas projects were meant to encourage the use of the SALC as a place for research without explicitly requiring students to go there. They found that the experiment was successful in encouraging use of the SALC; however, they noted that “more users [of the SALC] does not equal more autonomous learners” (p. 55). It was also noted that further research was needed to clarify whether opportunities for curricular links helped develop autonomy and also whether motivation and personal initiative increased as a result of curricular ties. McMurry, Tanner, and Anderson (2010) report the creation of a Self-Access Center website and database at Brigham Young University (BYU) that contains objectives specific to skill area and proficiency level along with SAC materials that can be selected for each objective, but they do not indicate how another SAC could create one of its own. They also report data based on pre-database and post-database surveys that seem to indicate a trend toward increased autonomy, or at least a decrease in the number of students who use their SAC because it is required by a teacher. However, their data with respect to autonomy are not entirely clear, and they state that “the database and Web page were useful, but no direct connection between them and center use could be made” (p. 110). As evidenced in Thompson and Atkinson (2010) and Aldred and Williams (2000), students may react in different ways to the vast amount of materials that a SAC provides. Reactions can range from simple indecision to anxiety over their inability to locate materials. The sheer amount of presented materials can be particularly overwhelming for students at the lower levels, as they are not only faced with a large number of materials but a potential language barrier in asking for help to locate materials. The University of Delaware (UD) English Language Institute (ELI) Self-Access Learning Center (SALC) has created a Course Objectives Database (COD) similar to the BYU SAC database. The COD was supplemented with a website that links objectives to SALC materials and internet websites as part of an Individualized Education Plan (IEP) system. This system is similar to iLang at the Hong Kong University of Science and Technology (Center for Language Education, 2013), which also links SALC materials to broad objectives, but at UD the objectives are specific to course levels and narrow course objectives. The use of IEP in this instance should not be confused with the IEPs related to K-12 education and special education in the United States. The remainder of this article will outline the evolution of the IEP system. Additionally, for those who wish to implement the system in their own SAC, this paper will provide an overview of how this might occur. Finally, the results of informal surveys regarding SALC use will also be presented and discussed. 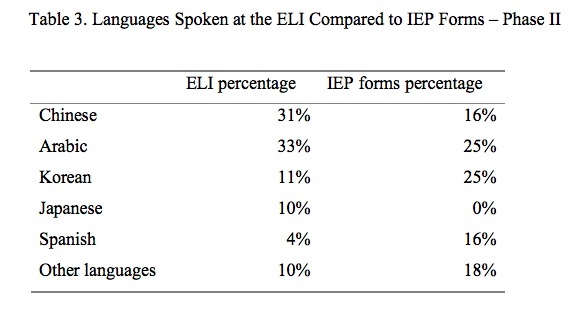 In the time frame during which the IEPs emerged, the population of the ELI at UD consisted of students speaking the native languages shown in Table 1. Autonomy and knowledge of one’s own learning style are generally considered necessary for successful SAC use. Reinders (2010) reported four phases of autonomous learning: defining tasks, setting goals, enacting study tactics and adapting future study based on observations and reflection. While the University of Delaware ELI’s IEP system incorporates some of these concepts, it does not at this time rely on learner input to determine objectives, but rather balances course-related objectives with student goals and reflection. Students choose from a list of course objectives and the range and scope of objectives is thereby limited only to items covered in ELI classes. The goal-setting phase allows for more individual choice; students are instructed to set goals for themselves for each week as well as for the session as a whole. Study tactics are not generally addressed, although students are guided to online learning styles surveys as well as online study skills training through a series of links. Adapting future study is a collaborative process between the individual student and the SALC staff that occurs during individually scheduled meetings. Students are encouraged to assess progress made on their goals at the end of the academic session and use that self-assessment to create an IEP for the following session (though the pre-existing list of course objectives is still the main basis of goal-setting). Finally, SALC staff at the ELI recognized that students would first need a transition period in which to begin examining how to learn (Thompson & Atkinson, 2010). This transition period, in which autonomy and metacognition are directly or indirectly introduced as skills, is ongoing, and the SALC staff sees the development of a completely autonomous system of materials selection as a long-term goal, perhaps even a goal that will never be completely accomplished since the average student at the ELI studies for approximately one year. Thus, with a one-year turnover, the SALC would need a consistent cycle of scaffolded work in autonomy and metacognition. Preceding the introduction of the IEP system, the SALC created the COD. The COD was essentially a spreadsheet that combined the listed objectives for each course at the ELI with a quick list of the available resources in the SALC matching the objectives. These objectives were pulled from the course syllabi. The objectives were broken down into two separate “pages” within the database – Listening/Speaking and Reading/Writing. Within the Listening/Speaking page, the objectives were further broken down into subcategories for Listening, Speaking, Pronunciation and Vocabulary. Within the Reading/Writing page, the objectives were broken down into the subcategories Reading, Grammar and Writing. For each objective the following information was provided: a link to an external website to practice the objective, a list of the software programs available in the SALC addressing that objective, and a list of books and other materials that were available to practice the objective. (See Appendix A for an example page from the COD.) Ultimately, this system proved disadvantageous for several reasons. First, curricula shift over time, rendering COD/syllabus links obsolete. Second, it is only possible to create one hyperlink within a cell in the Google Docs version of Excel used in the SALC. While additional cells could have been added, this would potentially have resulted in a spreadsheet containing many individual entries, which would have been difficult for users to navigate, thereby negating the intended purpose of the COD. Additionally, SALC users did not have a simple way to reference the objectives that they wanted to practice without writing down the resources on a separate sheet of paper, and the URLs for the links were not easy to locate without background knowledge of Excel. Hyperlinks were attached to descriptions, masking the URLs; that is, students could not see the URLs in the database without knowing how to unmask them. The COD’s format proved to be unwieldy and not user-friendly. In fact, in tracking usage patterns with Google Analytics, the COD page on the SALC website received only ten unique hits in a one-month period, versus the 870 unique hits on the SALC homepage. While the COD intended to make materials more accessible, it did not succeed. IEPs were constructed with the idea of matching students by level and objective with the best materials in the SALC. The original IEP forms are included in Appendices B and C and were based heavily on Gardner and Miller’s (1999) Learner Profiles. There were two versions of the form. One was primarily for teachers who wanted to refer students to the SALC to practice certain objectives outside of class time (Appendix B); the other was for students who came to the SALC of their own accord for additional practice (Appendix C). Once one of the two initial forms was completed and brought to the SALC by either the student or teacher, students were asked to sign up for an appointment time 24 hours in advance. This gave the SALC staff 24 hours to create an individualized plan for the student based upon expressed educational goals or the areas of work indicated by teachers. The original iteration of the IEP allowed for two modes of direction: self-directed study and teacher-directed study. These two modes would suit students who had a low degree of autonomy and were perhaps not intrinsically motivated to study on their own, as well as students who had a high degree of autonomy and were more intrinsically motivated towards self-study. In the first iteration of the IEP (Appendices B and C), the forms were filled out in the following percentages: 32% teacher-generated and 68% student-generated out of a total number of 52 forms over a 6-month period. This result differed from the SALC’s expectations; in fact, it was expected that more IEP forms would have been teacher-generated in the initial phase of implementation. There are external factors that may have contributed to the higher percentage of student-generated forms. First, it seems likely that teachers were generating more forms and distributing them to their students in the classroom, but the students did not follow through by coming to the SALC with the teacher-generated plan. Second, the paper-based original format of the IEPs constituted a time commitment for a teacher, who would need to find the form, print it, and fill it out for each student’s specific needs. However, students who entered the SALC for other reasons initially (e-mail, printing) could easily have spotted the education plans and filled one out without a significant amount of effort. A high percentage of IEPs were also completed immediately following SALC orientation for new students. Students were introduced to the concept of the IEP during their scheduled orientation and often filled out a plan before leaving the initial orientation session. The orientation session essentially created a “captive audience” for the IEPs. It must also be noted that, although the orientation is listed as required for new students, it is typical for primarily the most motivated students to attend the orientation as attendance is not taken and there is no accountability for this attendance. This tendency resulted in an artificially high number of IEPs being completed for this group. Compared to the general student population of the ELI at this time, the IEP forms were filled out in differing percentages as outlined in the chart below. It can be noted that Chinese speakers appeared to fill out fewer IEP forms than may have been expected based on the relatively large Chinese population at the ELI, while Spanish and Arabic speakers filled out more IEP forms than may have been expected relative to their populations. 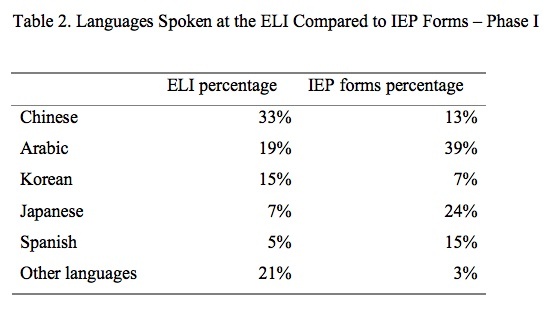 The difference in percentage of Japanese speakers who filled out IEP forms was due to a special program that required IEPs. After several eight-week sessions of using paper versions of the IEPs, the SALC staff decided to move the forms online in order to reduce the amount of paper waste and facilitate teacher access to the forms. Additionally, the online form had built-in logic that “tracked” students into two different surveys based upon their level (Appendix E). Students in levels I-III (beginner – lower intermediate) received a simplified survey and students in levels IV-VI (high intermediate – high advanced) received a more detailed questionnaire. Students were also asked to enter their email twice at the end of the survey to indicate that they would follow through to make an appointment with SALC staff. The process of making appointments also moved online, and students were directed to a link at the end of the survey, which allowed them to directly email the SALC coordinator (co-author Servais) to schedule an appointment. The purpose of these extra steps was to reduce the number of no-shows. Compared to the general student population of the ELI during Phase II, the IEP forms were filled out in different percentages, as outlined in the chart below. Again it may be noted that Chinese speakers appeared to fill out fewer IEP forms than may be expected, while Spanish and Korean speakers filled out more IEP forms than might have been expected. Zero forms were filled out by Japanese speakers because the special group program had ended. In this second iteration of the IEP, there was a major change from the paper version. Following Phase II, the surveys were filled out in the following percentages: 72% teacher-generated and 28% student-generated with a total of 56 surveys completed over a 6-month period. Students were made aware of the change from paper to electronic IEPs through orientation and personal communication; teachers received an email update including the new IEP information. Despite the apparent lack of use of the COD and the increasing amount of time required to complete IEPs, the general consensus among ELI faculty (gathered during brainstorming and evaluation sessions at faculty retreats when a large majority of the full-time faculty were present) was that IEPs as a whole were quite successful. Anecdotal evidence gathered via an email questionnaire from the 5-6 teachers that most frequently used IEPs since their inception in 2011 suggested that teachers found the IEPs useful on several fronts. Questionnaire respondents noted that the IEPs helped teachers “be more intentional in sending students to do independent work and identifying weak areas to be addressed” and “point the students to [more] specific skills and micro-skills.” Additionally, several teachers felt “reasonable assurance” that students would go to the SALC “at least once,” unlike the situation prior to the creation of the IEPs when teachers felt that there was “less assurance that the students would go.” Teachers also seemed to find the implied formality of a paper or electronic form useful in heightening student perception of the importance of the task. Furthermore, after successful IEP use was reported in the email questionnaire, more teachers wanted to recommend IEPs to their students. Some teachers also indicated that they had built SALC work into their graded assessments for their courses, thereby making independent study in the SALC mandatory. This presented a conflict with the underlying principles of self-access learning, but as noted in Thompson and Atkinson (2010), teacher-directed use of an SALC can be beneficial in promoting the initial use of the center. Also problematic was the fact that the SALC was already suffering from a time constraint in preparing the IEPs that were being completed each session. On average, if each IEP took approximately 30 minutes to complete and approximately 50 IEPs were created each session, that represented 1500 minutes (or 25 hours) of work on IEPs every six weeks. At the ELI, only one staff member was dedicated to the completion of the initial phase of the IEPs (matching student goals with resources) and two to three staff members were available for the IEP follow-up meeting in which students were shown how to locate the resources within the SALC. An instruction sheet on completing IEP forms for students was created (Appendix D), but it was ultimately inefficient in its intended purpose of redistributing the workload. Based on discussions at faculty meetings, more teachers wanted to consider using IEPs and including them as graded assessments for their class. With the system as it stood, this would have been logistically impossible. Over the course of several sessions, the SALC coordinator had also noticed that many of the best and most useful resources were repeatedly recommended, and, in a sense, creating an individual IEP for different students who were at the same level in the same class was a bit like reinventing the wheel. Past plans for students at the same level could have been (and certainly were) referenced in preparing the new plans, but this was still quite an inefficient use of time. Beyond this, since only one person (the SALC coordinator) was aware of all the possible resources that could be used and referenced, the system ground to a standstill when the coordinator was engaged in other work duties. The most feasible solution beginning to emerge was that all the information about available resources needed to be gathered, sorted, compiled and reported so that any SALC staff member or ELI teacher could generate an IEP for a student. The known resources were located in several places, including the COD, the links section of the SALC website, and IEPs that had been generated in previous sessions. After gathering and sorting the necessary resources, a method of organization was not immediately evident. The COD, for example, had all the objectives for all levels listed on one page of a spreadsheet. When adding in multiple links and resources, it would have been possible to have the sheet for Listening/Speaking consist of over 500 spreadsheet rows. This would have proven difficult to navigate, particularly for students at lower levels. Meanwhile the online survey, which included if/then logic and could have helped to narrow down the level and skill area, would have been difficult to link to an outside source like a Google Document with the list of resources. Each objective was linked to at least one website or locally housed resource. A total of 212 unique objectives were identified. Objectives were compared within a level in order to make navigation simpler. For example, if at Level VI Listening/Speaking there were six different courses such as English as an International Language, Drama, or EAP VI, the objectives were compared across the level and a single logic chain was created for that level. Over a period of approximately twelve months, a survey about SALC usage was made available as a link on the SALC homepage. The link was part of a rotating display of several other images, so it may or may not have been visible on a random visit to the SALC homepage. In addition, the survey was not advertised beyond this link, nor was it required of students. In spite of the non-compulsory nature of the survey, a total of 80 participants anonymously and voluntarily filled out the survey after following the link. Below are the results of the survey, divided into two sections: responses collected prior to the implementation of the IEP system (approximately a six-month period), and responses collected after the implementation of the IEP system (approximately a six-month period). The numbers of responses at the beginning of the trial were not equal to the numbers at the end of the trial, so while percentages may increase, numbers may decrease. Because the surveys were anonymous, it is not known whether any individual repeated the survey, though there is no reason to believe any individual did so. The level/nationality of the respondents is also not known. Though the data set was small and procedures were not rigorously controlled, the trends seen in the data are similar to trends that were reported at BYU. Our data also suggest that further research may find links between the use of IEPs or a course database system and increased autonomy, the goal of SACs. Students were asked about the frequency of their visits to the SALC. No significant change in frequency of use was noted after the introduction of the IEP. This may be because student schedules and overall amount of available time did not change. In this question, students were also asked to identify the main purpose for which they came to the SALC from a list of options. 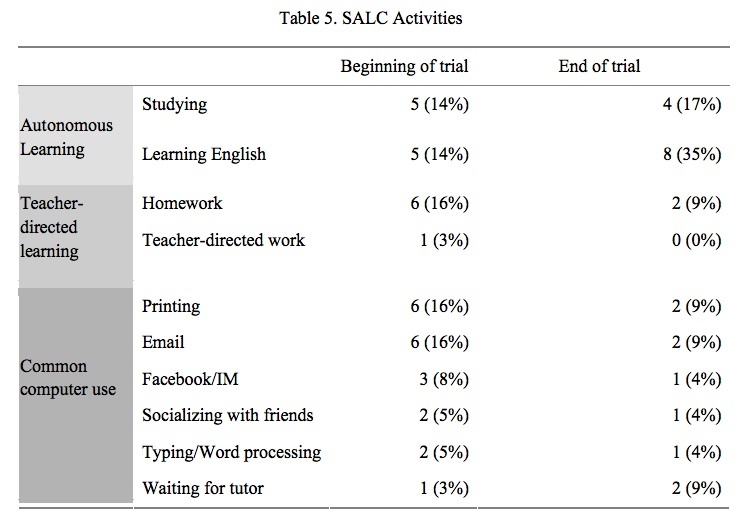 After the introduction of the IEP, increases were noted in autonomous/self-directed language learning uses of the SALC (studying and learning English). Conversely, teacher directed activities and common computer usage decreased over the same time period. This trend is similar to that reported by McMurry, Tanner, and Anderson (2010). Students were asked if they were aware of the existence of the SALC homepage and website. Awareness remained unchanged before and after IEP introduction, likely because the SALC website was set as the homepage on all SALC computers for that entire time frame. While awareness of the existence of the website was unchanged, students’ use of the website for language learning purposes seems to have increased after the introduction of the IEPs. Students were asked if they had used software in the SALC for the purpose of improving their English. 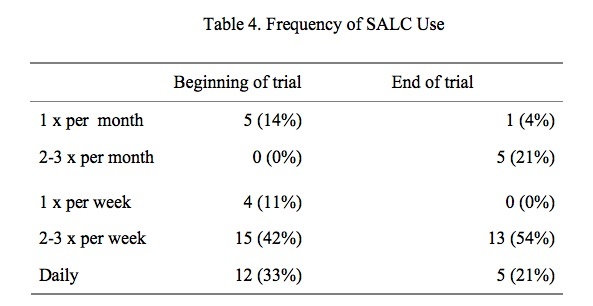 The percentage of SALC users who used language-learning software seems to have increased over the course of the trial. Students were asked if they had checked out a leveled reader from the SALC at any time. These numbers suggest that checkouts of reading materials increased over the trial period. Students were also asked the reason for checking out a book. Four options were provided: Teacher assigned, I enjoy reading, I wanted to learn vocabulary, and I saw the books and was interested. Before the trial period, slightly less than half of the survey respondents indicated that their teacher directed them to the leveled readers. During the trial period, there was an increase in the amount of independent reading. No major conclusions can be drawn, but more study may reveal an increase in autonomy. Additionally, it appears that students developed more specific goals related to reading after the IEPs were introduced. While “enjoyment” could be seen as an unfocused objective related to prior modes of behavior, increasing vocabulary can be seen as a focused objective related specifically to language acquisition. In this way, it appears that students may have become more aware of their learning processes and goals after using the IEP. Informal results, anecdotal reporting and observation seem to indicate that the IEPs were “successful” to some degree, particularly in encouraging more self-directed behaviors and use of the SALC for its intended purpose. It also seems that the IEP served as a “pathway” (Thompson & Atkinson, 2010) from the classroom to the SALC for several reasons. First, teachers were able to send students who may not have been intrinsically motivated to study in the SALC for work on specific goals and objectives related to their course, thereby getting “reluctant” independent learners to take the first step toward working independently in the SALC. Second, learners had a method for opening discussion with SALC staff. Third, the IEP allowed for a simple way to introduce learners to a limited number of materials that would be suited to their level and purpose, thereby reducing the overwhelming effect that SALCs can sometimes have on new users (Thompson & Atkinson, 2010). Although the data was informally gathered and no strong conclusions can be drawn, the data suggest that future study might reveal a link between IEPs and increased autonomy and independent learning. It should be noted that teacher anecdotes frequently revealed the necessity for a (simple) means of follow-up between SALC staff and teachers about the individual students who were assigned teacher-directed IEPs. Unfortunately, due to time constraints, there is no method for reporting this information currently. One possible future area of research would be an examination of what occurs when student use of the IEP/SALC is clearly reported back to the referring teacher on a consistent and regular basis. While this feedback loop may reduce the amount of autonomy, it is arguable that students who are teacher-referred may have learning gaps that should be addressed before a significant effort is made to develop their autonomy and metacognition skills. Additionally, since the two surveys at BYU and UD produced varied and inconclusive results, and because UD’s informal survey’s total numbers were relatively small, a third reporting of results after the implementation of an online database/IEP would be beneficial. Kenneth Cranker is a former Self-Access Learning Center Coordinator and is currently a full-time faculty member at the University of Delaware English Language Institute, teaching primarily English for Academic Purposes. Nicole Servais is the Self-Access Learning Center Coordinator and an instructor at the University of Delaware English Language Institute. Aldred, D., & Williams, G. (2000). The need for a focused approach: A case study. Links & Letters, 7, 81-93. Cotterall, S., & Reinders, H. (2001). Fortress or bridge? Learners’ perceptions and practice in self access language learning. TESOLANZ, 8, 23-38.